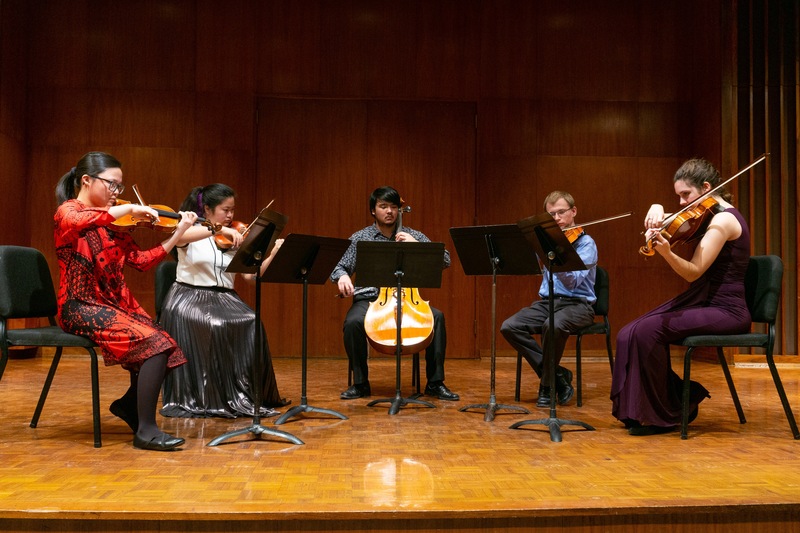 The Vermillion Quartet performs in Harper Hall. Although I have seen and heard string quartets play several times, this was my first experience with a string quintet. As you would expect, the sound is similar, although the addition of a second viola rounds out the middle quartiles of the ensemble’s sonic range. In this way, a bit of symphonic texture is imparted to the string quartet’s iconic chamber music sound. Every voice can still be heard in its distinct harmonic role, but with a fifth player there is just enough overlap to give the sonorous impression of an orchestral string section. Aside from noting the contribution of a second violist, I do not have too much else to say about the performance itself. This is not because I did not enjoy it; the Vermillion Quintet played beautifully. The reason is I simply have not had an opportunity to develop an “ear” for string music in the same way I have for other types of music. I have been eager to cover brass concerts in the past because I have spent years learning a brass instrument and I am much more familiar with the particularities of brass music. When I listen to brass music, for instance, I feel like I can ‘see’ the music with relative clarity. When I listen to string music, I still see it, but I do not have the familiarity and experience. The object is still there, but it is fuzzy and relatively undifferentiated. This certainly does not diminish my aesthetic appreciation of the music, but it does impair my ability to critique it. A wine critic is only qualified to pass judgement on a wine after sampling many others over an extended period of time and developing the palette needed to discern subtle differences in taste and quality. Just as all wines taste about the same to me, so too is my palette for string music underdeveloped. Accordingly, as I listened to the Vermillion Quintet’s concert, it sounded…good, for lack of a better descriptor. As the quintet moved through each movement of the Mendelssohn piece, I followed along as best I could. I listened to the melodies and the ways in which they were supported, sculpted or inflected by harmonies. I listened to how each movement contrasts and complements the others. I tried to listen to each individual part and how it related to the music as a whole. I observed how the musicians moved together and subtly interacted to help their playing cohere. I tried to imagine the composer’s state of mind as they wrote the music, tried to imagine what motivated or inspired them. I paid attention to memories and impressions the music evoked to try and get a sense of the composer’s artistic intent. When faced with this kind of novelty, the best you can do is just listen and see where it takes you. The same was true for the latter portion of the program. “Phantasy for String Quartet in F minor” by Benjamin Britten and “Phantasy Quintet” by Ralph Vaughan Williams. The word “phantasy” conjures associations of fairy-tales, unreality and possibility. What sort of mythical worlds and stories were these composers imagining through their music? My immature string music palette offered no technical vocabulary to respond to this question, but by virtue of that vacancy I could fill in the blanks with whatever came to mind.